CWS has just what you need for your Waste Pickup, Dumpster Container Rentals and Recycling Services. We’re fully licensed and insured with dozens of years of experience in the solid waste industry. Located in Columbia, SC, Capital Waste Services offers a wide selection of sizes for your clean up needs. CWS has not forgotten the art of CUSTOMER SERVICE. Our friendly and knowledgeable staff will always treat your site like our own. We ensure that after each pick up, the bin area is cleaned and undamaged and all gates are closed as needed. We service Columbia, SC and the surrounding area, including Florence and Sumter. We are licensed to operate all over the Midlands of South Carolina such as Richland, Sumter, Lee, Lexington, Calhoun, Clarendon, Saluda, Newberry, Fairfield, Kershaw, Darlington and Florence Counties. Let our friendly staff provide you with a free waste evaluation today. Contact us for more details, we will provide you with a free quote and set up your delivery date and time. Remember – Capital Waste Services is a Locally Based Company in South Carolina. Our rates are much more competitive than the National Waste Haulers! Have the container you need delivered to you, when you need it. Clean dependable service. Competitive prices on all our containers. Roll Off, Front-End Commercial, Recycling - Call today for a Free Estimate! Do you need a container for your restauraunt? or Commercial building? We offer Roll Off Containters for Construction, Demolition and Recycling Services too! No matter what the application, if you need regularly scheduled trash pick up, a Front End Container from CWS can meet your needs. 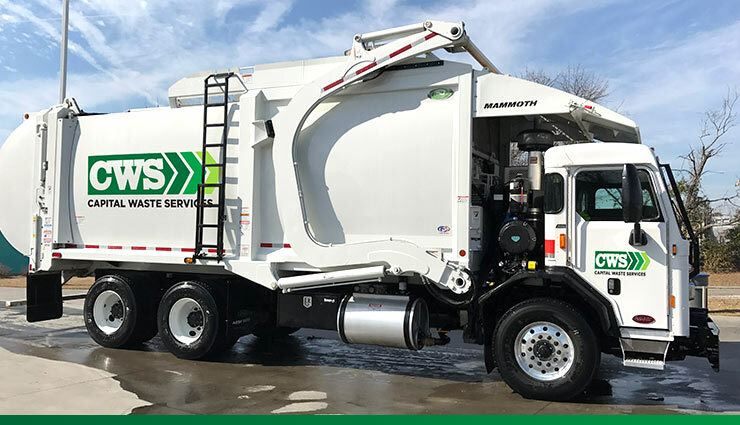 No matter what the application, if you need regularly scheduled trash pick up, a Compactor from CWS can meet your needs. If you need a Compacting container for trash or recycling, we offer competitive rates for your business! No matter what the application, if you need regularly scheduled trash pick up, a Roll Off Container from CWS can meet your needs. Roll Off Containers are large, rectangular "boxes" with an open top and a large swing door for easy loading. A 12-yard container is typically used for concrete while a 15-yard container is popular for small jobs. The larger 30-yard & 40-yard containers are great for large jobs for construction and industrial waste. Choosing A Size: WE CAN HELP! Choosing container sizes is not an exact science, so contact us and one of our friendly staff can help you choose the best size for your needs & give a free quote!